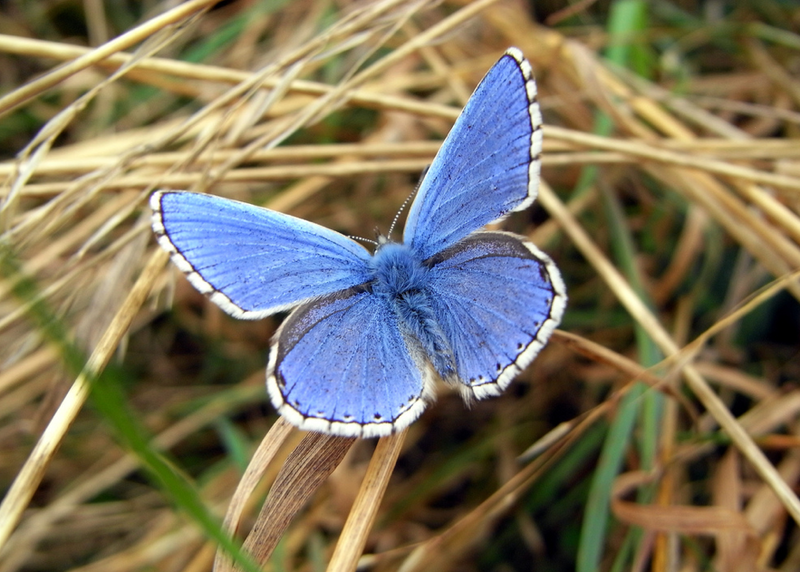 We hadn’t found an Adonis blue on our late May trip to Rodborough Common. Too early, we were told by the seasoned butterfly spotter we encountered, though apparently he’d seen a single female (not blue, sadly) fluttering about somewhere too far away to tempt the kids to walk to, especially as we’d run out of biscuits. So we decided – as with the frogs – to see if we could grow some of our own. Butterfly kits can be had for about a tenner: uncharacteristically however, Jim splashed out and £13 later we were taking delivery of a large parcel from Yellow Moon. This was a colourful, collapsable, cylindrical net ‘house’ in which the caterpillars, once safely cocooned in their chrysalids, would undertake the extraordinary transformation from unprepossessing grub to glorious butterfly. 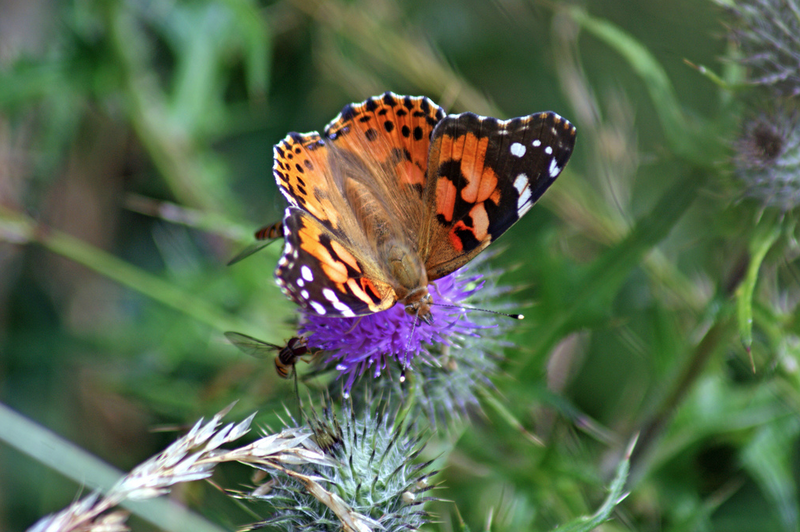 You don’t seem to be able to get Adonis blue caterpillars in these kits so we went for Painted Ladies instead. These are spectacular orange and black butterflies that are large enough for a child to see easily when they open their wings, crucial to getting Sam and Mungo to be – we hoped – impressed by the end result. And grow they did, just as promised, into great big fat furry caterpillars. All the food they need is contained in the cup, so you don’t have to be bothered sorting out salami, cupcakes, cherry pie or watermelon for their dinners. Left in a cool, quiet spot, the caterpillars took around three weeks to crawl, as promised in the instructions, to the top, attach themselves to the lid and create a cocoon. There, one morning, I found one dangling, and pretty soon there were four dark brown oblongish cocoons all hanging together. 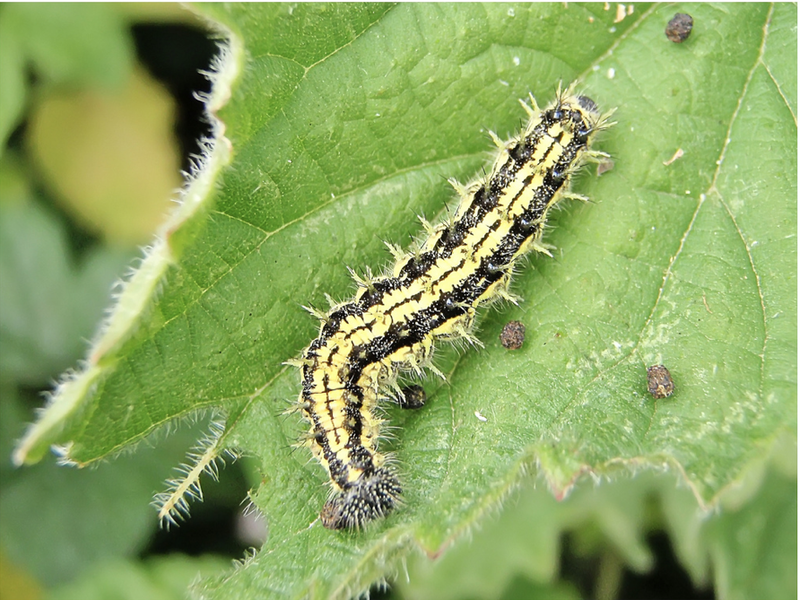 Caterpillar number five, I’m sorry to say, was rotting on the bottom. We hadn’t seen it for a bit, and had suspected as much. But an 80 percent success rate from grub to chrysalid must be at least comparable to the fate of a tiny caterpillar in the wild, so we were rather cockahoop with progress to date. The next step was to transfer them, still dangling precariously on the slightly tattered paper disk to which they had stuck themselves, to the side of the butterfly house, and safety-pin them on. At this point, the instructions warned, they had to be left absolutely alone to undergo their metamorphosis, which would take seven to 10 days. So we left them in front of our (unlit) woodburning stove, behind the fireguard, in our coolest room, where the children couldn’t get at them. One, sadly, dropped off so I placed it gently, as instructed, on a piece of paper towel near the side of the butterfly house. But I didn’t hold out much hope – it looked a bit damaged, whether from its fall or from not being a very good cocoon-creator. Seven days passed. Then eight. Then nine. Nothing. We’d pretty much concluded they were a gonner. It must have been around 12 or 13 days later that I happened to look in, with very little hope, and saw, with a sudden thrill, two Painted Lady butterflies, wings fully outstretched, moving up and down in that stiff, slow way they do. I didn’t know how long it had been since they ‘hatched’, but both seemed to be well dried out (they emerge with their wings wet and folded in crumples like poppy petals). They even did a couple of little flutters around their net enclosure. I didn’t think it was fair to leave two newly born butterflies inside a net prison just so we could have the pleasure of staring at them. So Sam and I (Mungo wouldn’t come out) took them into the garden for the grand release. After we’d set our two brilliant, blazingly fresh Painted Ladies free I dropped the boys at school and the childminder, so neither witnessed the tragedy that was about to unfold. When I got back the third butterfly had begun to emerge. 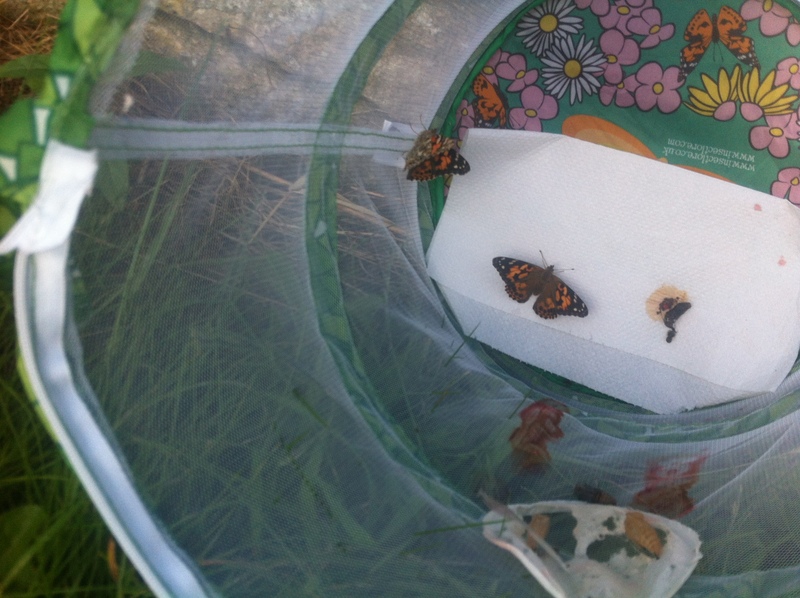 One wing unfurled, its orange and black markings stunning in the sunshine… and then the other… but then, disaster. The second wing had clearly got stuck. Half unfolded, something was stopping it from fully extending. I gazed, horrified, as the butterfly tried to stretch its wing free. I went inside, had a cup of tea, then went out again, heart in mouth, to see if any progress had been made. But no. The creature had moved: it had managed to flutter to another part of the butterfly house, but its wing was still trapped. I tried to nudge the delicate, folded membrane free of its chrysalid casing with a cotton bud, terrified of tearing it. But it wouldn’t budge. An hour later, it was in the same state. And when I came out for the last time, the butterfly had vanished. I can’t imagine that it had worked itself free. It probably got eaten by one of our garden birds. I felt absolutely gutted. But… two butterflies out of five caterpillars. I suspect that’s a much better success rate than would happen in the wild. And I wonder if we’ll ever get to see that Adonis blue? We bought our ‘Butterfly Garden’ from Yellow Moon (http://www.yellowmoon.org.uk).